I’ve never been one to be hungry in the morning and usually skip breakfast, however I do enjoy my morning cup of coffee and on occasion a scone or breakfast bread. On the other hand, my son Josh makes a big breakfast every day and is a master at making omelettes and breakfast sandwiches. 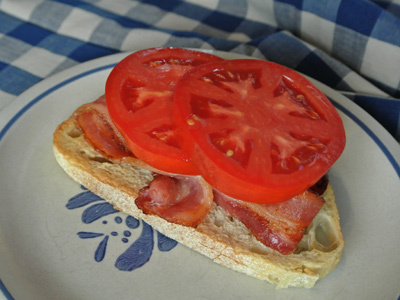 Recently he put together an open faced sandwich that left my mouth watering so I set about recreating it. 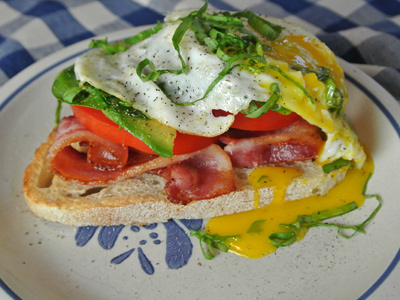 I call it a BEAST or bacon, egg, avocado, spinach, and tomato. 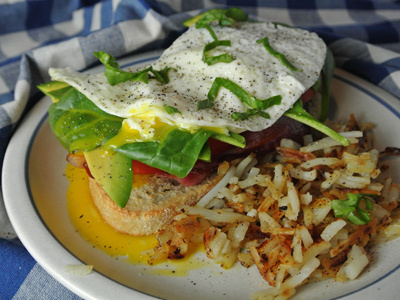 It’s one satisfying breakfast sandwich. 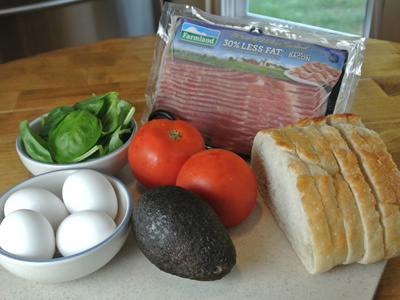 Very simple, just some sliced sourdough bread, bacon, spinach, sliced tomato, sliced avocado and eggs. Fry bacon over medium high heat until crisp on both sides. 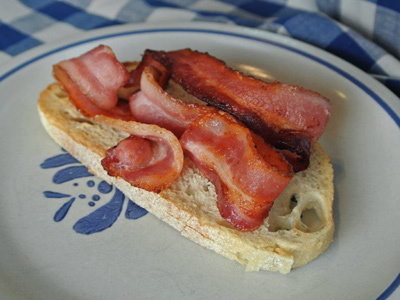 I toasted the sourdough first, then layered with 3 slices of bacon. Next comes 2 thick slices of tomato. Place the spinach leaves on top. When the hot egg hits the spinach it starts to wilt slightly which is so good. Add a fried egg over top. If you’re really hungry add 2 eggs. Add salt and pepper with some finely shredded spinach over top. It may look messy, but it sure tastes good! It seemed only natural to add some hash browns cooked in the leftover bacon grease on the side. 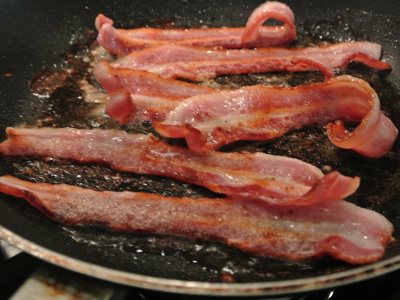 Fry bacon in a skillet over medium high heat until crisp on both sides. Pat dry on paper towels. Set aside. 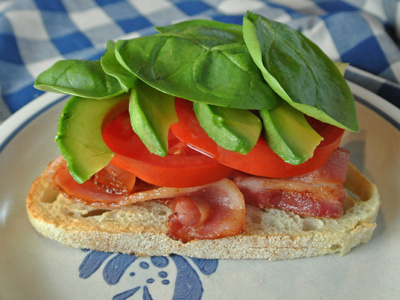 Toast sourdough bread slices and begin layering each with 3 slices of bacon, 2 slices of tomato, 4 slices of avocado, and a few spinach leaves. 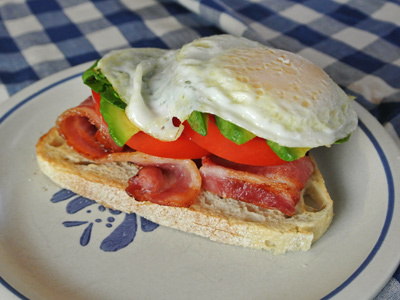 Fry eggs over easy and place 1 egg over each sandwich. Salt and pepper to taste. Sprinkle finely chopped spinach leaves over top if desired. Any reserved bacon grease can be used to fry hash browns. Makes 4 open faced sandwiches. That looks delicious. 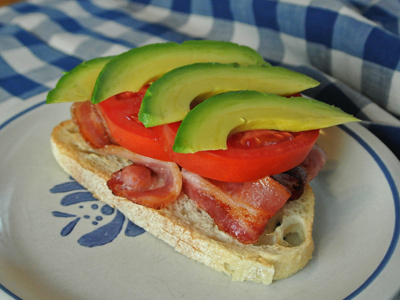 I would make this for lunch! It would make a great lunch! Holy moly, that looks amazing! My mouth is watering just looking at it. This is the crème de la crème of breakfast sandwich! Thanks, I’ll pass along your praise to Josh who really deserves the credit!